I have been very interested in Indian cooking lately, much to the delight of family and friends. I've been experimenting to find the perfect butter chicken, chicken tikka masala and lamb rogan josh recipes. I think I've got the rogan josh to my liking but keep repeating the butter chicken and tikka masala recipes (again to the delight of family who are far less critical of my cooking than I am) trying to achieve that deep, rich, complex flavour. 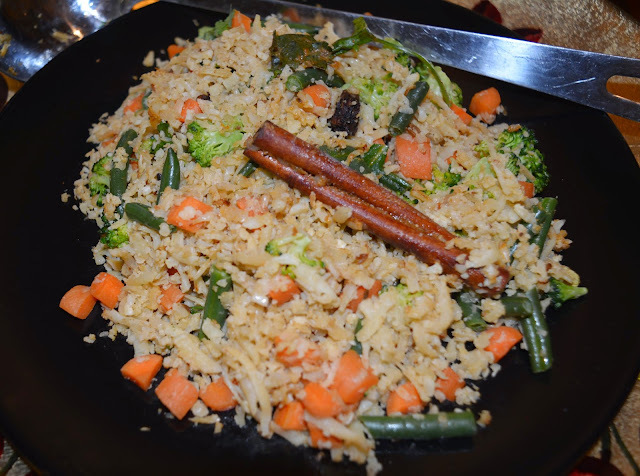 In my wanderings through the recipes I created a "paleo" version of my favourite side dish, veggie pulao. The traditional recipe calls for peas, beans and potatoes. I've put quotes around "paleo" as I will often swap out broccoli for either the peas or beans and consider the other as part of my 20. If these barely-legumes bother you then take them out entirely and swap with your favourite other veggie. It's all going to taste good. Potatoes just get chucked out entirely. I suppose you could use bits of sweet potato but you'd have to pre-cook the cubes and then they might turn to mush during the stirring. When you serve the pulao, leave the whole spices in (but warn your guests about them) as they look and smell amazing. Cooking happens fairly quickly so before you start, gather all ingredients and have them ready by your pan. When the ghee starts to shimmer add cinnamon, cardamoms and cloves to the pan and cook, stirring, for 1-2 minutes until fragrant. Add cumin and simmer 1 minute until fragrant. Add ground spices while stirring - do not let them burn or you will need to start over - stir for 30 seconds. Add the vegetables and turn heat to high. Stir to coat with spices and ghee. Allow veggies to cook, stirring frequently so cauliflower browns but does not burn; about 5 minutes. Take it off the heat while the cauliflower rice is still firm as it will continue cooking for a few minutes more on its own. You want the "rice" to be tender but firm and not soggy (although it will still taste delicious if you overdo it). Plate and add garnish as you wish. Let me know if you try this with some sort of tuber and how they held up during cooking.